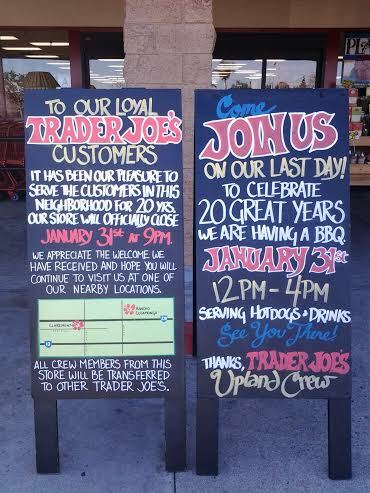 Trader Joe’s came to Upland in 1994 and is leaving 20 years later, on Jan. 31, reports my colleague Liset Marquez. Scuttlebutt is that the landlords of the Mountain Green Shopping Center wanted to raise the rent more than the specialty grocer felt it should pay, although nobody’s saying that officially. Party City is moving to the center across the street, as Honey Baked Ham did a couple of years back, both lending credence to the rent theory. The Upland store, a little undersized, was always jam-packed, and it paid to visit during off-hours when there might be room to maneuver the tight aisles and time to examine unfamiliar items at leisure. Visiting became less essential after Joe’s locations opened in Claremont and Rancho Cucamonga (*and Chino Hills), but Upland’s was still useful for people on the West End. (I once saw Greg Devereaux, then Ontario’s city manager, picking up a few things one evening.) Those other stores no doubt diluted traffic at the Upland location. Leave your own thoughts on the store’s impact and departure below, or on your memories of the shopping center, which I believe dates to the 1980s, or perhaps earlier. that I think is now Wicks. When they left there, I was pretty unhappy, because there was no other TJ’s nearby. So when the Upland store opened I was thrilled, and I still shop there occasionally even though there are closer stores now. It does make you wonder, doesn’t it, if a landlord who out-prices his tenants has something bigger in mind. A reconstruction/facelift for the center? A new, bigger tenant? I guess time will tell. Makes me feel old to actually remember that this store used to be that one, and was another thing before that…. If it was a showdown, Trader Joe’s blinked. And hey, as fast as some spaces turn over, you could be 4 years old and remember when one storefront was something else. TJ’s was in the row of outdoor storefronts, south of and facing the mall in Montclair. The word on the street was that they had to leave because of the rent increases. We lost the wonderful Hollander Cafeteria from the mall to that outdoor strip for the same reason and it could not stay afloat on the outside. The same game keeps getting played everywhere, and we the customers are pieces in the game. The TJ’s location in Claremont is not going to be as convenient and the parking is sparser. I just hope it will stay put though, because I refuse to use anybody else’s pearl tomatoes. Oh, right, I’d heard somewhere about the Montclair Plaza location. Wonder when that was around, and if it essentially moved to Upland? Its been so long ago that I can’t recall if it was before or after the Plaza went two-story in 1985. The City of Montclair should have the records. If memory serves me correctly, there used to be a Jack La Lane gym/spa in the area near the “soon to be gone” TJ’s as well as a Skinny Haven Restaurant where I currently believe is a Japanese restaurant. One brings back fonder memories than the other. Don’t forget there is a Trader Joe’s at the Shoppes at Chino Hills as well for those in the area. I’d forgotten the CHills store, Louise. I’ll go back and add that to the post. I too remember skinny haven! Visited there often when I attended upland high. China gate has been in the same location since at least 1984. There was also a record store in the 80’s- licorice pizza I believe. Thankful to have trader joes in rancho now! That’s too bad. I remember when I first moved out to the IV, I thought it strange that Upland was the only city that had a Trader Joe’s. I used to shop there after work even though I lived and worked in Ontario. In cities without a TJ, most city hall folks will say it’s the most requested store. I remember this store being quiet in the weeks after Fresh and Easy opened across the way. But I think shoppers returned after the newness of F&E dimmed. Booo!!! We love this Trader Joe’s and shop there weekly. I hope the space stays empty for awhile so that the landlord feels the loss of Trader Joe’s as much I do. It feels like we have had a rash of closures lately, but the one piece of good news is that Sprouts is opening a new location in Upland – a location which, when I first moved to California, hosted an Alpha Beta. the reason, it’s just another loss of Upland! I’m incredibly bummed out that the Upland store is closing. I shop there several times a week, and love that I can walk there if I don’t have to haul larger, super heavy items. That store always felt like the hub of that shopping center, and the employees always treated me like family. I remember going in one day, almost a week before pay day and my budget was stretched, bought my groceries only to have my bag break outside the store and my eggs, milk, yogurt and a few other items were ruined, I thought I was going to break down in tears. 3 or 4 employees swooped in, helped me gather what could be salvaged then rushed in to replace the items that were ruined. I am still so very grateful for the kindness of those employees and it just drives home that the store is filled with wonderful people.I’m relieved that they are at least transferring to other stores. I’ll swap to the Claremont store on the way home from work, but The Upland store closing is going to leave a void that the customers of that center will certainly feel. What a touching story, Kelli. Thanks for sharing that memory. And good choice of words: Trader Joe’s did indeed feel like the hub of that shopping center. Very sad. Loved going in there to stock up on my lunch hour. 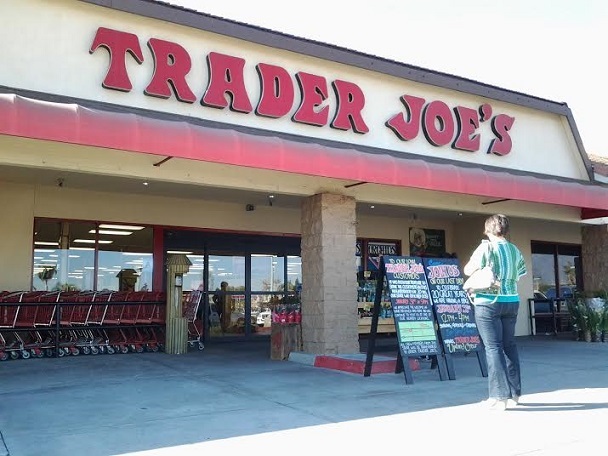 We are still waiting to get our first Trader Joe’s up here in the High Desert! We stock up when we are near the Palmdale store – which is a little over an hour away. Why would the landlords let TJ’s leave?!! Ridiculous!! Well the good thing about living in Pomona…..we’re surround by TJ’s. Claremont, Chino Hills & San Dimas. If the landlords of this particular TJ’s let them leave……they’ll live to regret it. What the frick!? This should not be allowed to happen! I hope nothing dumb gets put in there, like a women’s clothing place of something. Now where an I going to get Ezekiel bread and commune with other health nuts over mochi ice cream!? I have to go to CVS today. The parking lot is going to be like a ghost town. I think Montclair should start working on getting a TJ’s right now. By the way, Shirley, remember the day you saw me outside Handel’s? I was on my way to take the above photos of Trader Joe’s! Yes, I was already grieving. I usually have my ice cream at Handel’s on Wednesday, and then I would stop to pick up my pearl tomatoes, crunch salad mix, and bananas at TJ’s. Its going to cause me a lot more in gas money to go to Claremont now. It just shows how complex the whole goal of attracting business can be – something that we all understand from the decade-long brouhaha just a half mile south of the former Trader Joe’s location.